You need to keep the skin underneath your beard healthy and moisturized in order to have a healthy beard. 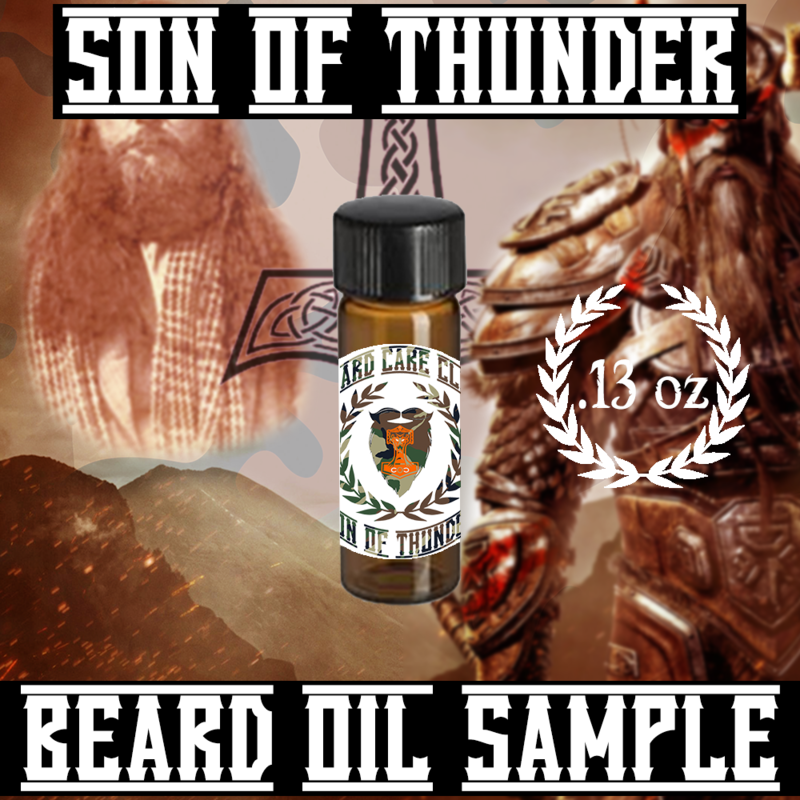 Our Son Of Thunder Beard Oil contains all natural ingredients to help condition your beard as well as promote beard growth. Beard Oils help keep the skin under your beard free of "beardruff", A.K.A beard dandruff, while leaving it itch free, soft, and manageable. Son Of Thunder was forged in Valhalla with the blood and sweat of Viking gods. The vessel that contains the beard oil was hand crafted from Odin's missing eye. The oil itself was created using tears of a Liger, the blood of Great White sharks, and the teeth of a Tyrannosaurs Rex. We blend this all together using a broad sword and a battle axe while screaming "you can't stop me!". It took 761 years to create this beard oil, luckily reincarnation comes easy thanks to owning a majestic beard. Once you put this on, you will have the strength of 10,000 men, agility of a cheetah, and the speed to run a mile in under 2 seconds. Mortals can't resist this scent and will kneel in your presence. Donning Son Of Thunder comes with great responsibility...... you have been warned. Since it was one of our owner’s birthdays in September, he wanted to make it all of his favorite things! Now if you’re wondering what Son Of Thunder really smells like, here you go. Son Of Thunder contains undertones of lavender along with a light note of citrus, followed with top notes of steam distilled leaves of the Pimento Racemosa. If you’re looking for something that’s light, but full of scent, this is it!